Liverpool coastguard received a “MAYDAY” from a vessel saying they had engine failure, and the position was somewhere near the Air buoy off Talacre lighthouse. Rhyl local coastguard were already near the area dealing with a dead washed-up North Atlantic Bottlenose whale, and were also tasked to Talacre. Dee coastguard and Flint ILB were also proceeding. The AWB launched and made best speed to the area. Also in the search was the Dee pilot boat “Patricia” from Mostyn. The sea was rough with a North-West force 7 wind. As the AWB arrived on scene, the local coastguard team stated they could not see anything off Talacre, so after a short period, Liverpool coastguard concluded this was probably a HOAX and stood all units down. The AWB arrived back on station at 1845. ILB launched and AWB put on standby after Holyhead Coastguard received a 999 call from a member of the public saying he had seen a man enter the water off the Sky Tower at Rhyl. The local coastguard team were already on scene when the ILB arrived in quite a heavy shore surf. The first informant was called by Holyhead coastguard, but he had left the area. The ILB searched with the coastguards for about 20 minutes, but nothing was seen. The ILB was told to return to station and the AWB stood down, as no further reports had been received by Holyhead Coastguard at 2215. AWB prepared to launch to back up ILB for woman in the water off Prestatyn. Situation resolved before boat launched, so stood down at 2138.Classed as standby. The AWB was preparing to launch as back-up for the ILB to a person in the water off Splash Point, Rhyl. As the boat was being pushed out of the boathouse, it was reported the person was now ashore and the AWB was stood down. Classed as standby. Both boats brought to immediate readiness after Holyhead Coastguard received numerous reports of orange flares off Prestatyn. The police helicopter NW1 and local coastguards went to the area but could find nothing. Reports came in of a small craft with engine failure off Barkby beach, Prestatyn, but this was dealt with by other craft in the area. with nothing being found, both lifeboats were stood down at 1318 to return to the Open day events. Classed as standby for both boats. Both boats requested to launch to search for a woman off Prestatyn beach committing suicide. The police helicopter and local coastguards were also tasked. The helicopter did a sweep of the beach from Rhyl to Prestatyn, but found nothing. It was then reported the woman was safe ashore and both boats were stood down. Classed as standby for both boats. Both the ILB and AWB were launched to the 21-foot yacht “Storm Dancer”, on passage from Conwy to Liverpool, which had experienced large surf off Prestatyn, and attempted to come inshore to get away from the heavy seas. 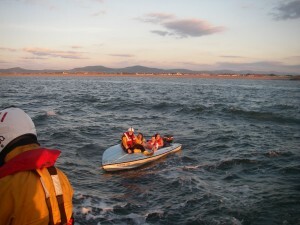 Their predicament was observed on shore, and the Rhyl Coastguard team were alerted, and both boats launched. The ILB located the boat first and succeeded in towing the vessel away from the surf line. the tow was taken over by the AWB off Rhyl, as the ILB was escorting the yacht under it’s own power towards Rhyl. 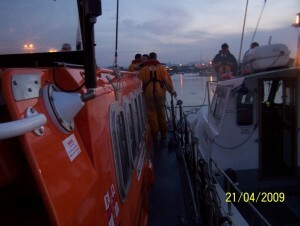 The 2 crew on the yacht were transferred to the lifeboat, which then anchored off Rhyl harbour to await the tide. This occurred just after midnight, and the crew then re-boarded the yacht, and they followed the lifeboats into Rhyl harbour, where the ILB crew assisted the yacht to find a secure mooring. The lifeboats returned to station at 0128. The AWB was launched to a rigid inflatable boat with 2 people on board in difficulties about 1 mile off Barkby beach Prestatyn with their outboard engine failed. The lifeboat took the boat under tow, but due to the surf at Barkby beach, it was agreed to tow the boat back to Rhyl where the boat could be safely beached. The trailer was transported to Rhyl station for the boat to be recovered. This was completed at 1715. Whilst the AWB crew were giving a ride to Colwyn Bay mayor and various dignitaries for Rhos-On-Sea Flag day, the crews’ attention was brought to a 14-feet length speedboat whose main outboard motor had failed, and the auxiliary engine could not propel the boat and it’s 4 passengers against the tide. The AWB went alongside and took the boat in tow to Colwyn Bay pier slipway, where the boat was recovered. The AWB then went back to it’s demonstration at 1510. Both ILB and AWB requested to launch to assist Coastguards and police helicopter NW1 in searching for a male who had threatened suicide off Barkby beach, Prestatyn. A search area of 4 miles of coastline, sand dunes, and the sea up to 2 miles out, were searched thoroughly for the man with no result. As reports of the man’s intentions were not 100% clear, all units were stood down at 2325, the boats returned to Rhyl at 0002 . A member of the public at Presthaven Sands camp, Prestatyn, could see a small dinghy drifting far out off the camp, and called the coastguard. 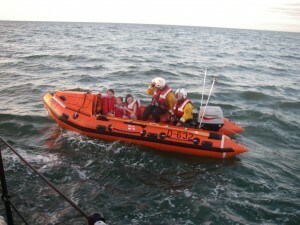 The AWB was also launched and was guided to the spot by the local coastguard mobile. A small angling boat had also gone to the dinghy, and was on scene when the lifeboat arrived. the 3m dinghy was unoccupied and was intact, but with no lines attached. It was towed back to Rhyl as there were no signs of recent occupation. the AWB arrived back at rhyl at 1920. Both boats were launched to assist police and coastguards search for a 65-year old vulnerable man who was last seen near Abergele beach. The boats searched from Towyn to Rhyl, and also in Rhyl harbour after a further sighting, but were stood down when the man was found safe and well near the harbour. The boats returned to station at 2355. Holyhead Coastguard received numerous reports of an object in the water between Pensarn and Llanddulas. The ILB was launched, and the AWB put on immediate readiness. The ILB arrived on scene , guided by crew at the boathouse, and found numerous large helium balloons tied together, drifting in the water. They were taken on board and the AWB was stood down, the ILB returning to station at 1615. The AWB was returning from an exercise at the Rhyl flats windfarm when Holyhead coastguard diverted the boat to look for a black and grey dinghy seen off Towyn, and shoes and socks were found at the waters’ edge. The ILB also launched and both boats searched the area for a short while. The first informant told the local coastguard team what they saw, and it looked like the sewer outfall buoy. With nothing else in the immediate local area, both boats were released and headed back to the boathouse. Incident closed at 2027. The AWB was waiting for the recovery team to prepare when the crew noticed a small local fishing boat off the entrance, with smoke coming from the stern, and then stopping, with a man looking into the engine compartment. The Coxswain headed for the boat which was just off the end perch. After coming alongside, the skipper said he had water in the fuel, and a tow was made ready to take back to Rhyl harbour. The boat was put on a mooring in Rhyl harbour and the AWB returned to station at 2110. The crew at the boathouse heard Liverpool coastguard launching Hoylake Lifeboat to a dive boat with it’s anchor chain around it’s propeller. The position was noted and it was determined that our boat was over 4 miles nearer to the casualty than our flank station. In conjunction with Holyhead coastguard, our boat was readied and proceeding down the beach to launch on service, when Liverpool coastguard reported the boat had freed it’s chain and was now proceeding OK, so both boats were stood down. Classed as standby for our boat. Both boats were launched after Police were called to a dispute and the man had said he was going to self-harm. He was from the Rhyl area and waves could be heard in the background. The boats searched together with coastguards and the police with the helicopter NW1, between ASDA Kinmel Bay shore and Splash Point, Rhyl. Nothing further was received, and due to some great degree of confusion regarding the man’s whereabouts, the search was called off, the boats returning to the beach at 0319. AWB requested to launch to assist Llandudno ILB after Holyhead coastguard received numerous 999 calls regarding a small day boat with 3 persons on board, looking to be on fire off Rhos Point. The casualty contacted Holyhead coastguard and reported there was oil from the engine dropping on to the exhaust, but all was well, and they were returning to Conwy. The AWB was just about to launch at this point, so the launch was aborted. The boat returned to the boathouse at 1128.. Classed as standby. Both boats launched to assist coastguards and police searching for a lady who had gone on to Prestatyn Beach from Presthaven sands Holiday camp, with the possible intention of self-harming. The police helicopter was also tasked. The ILB had been on scene for about 10 minutes, and the AWB for 5 minutes, searching between Rhyl and Talacre when Holyhead Coastguard called the search off, saying the woman had been found. All units were back on station by 1950. Details of the casualty and what the final outcome was are very sketchy.